Lease the 2018 Nissan Titan starting from $95 weekly for 24 months at 4.9% with $3,795 down on select models. 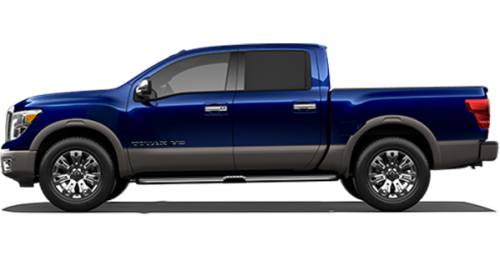 Representative monthly lease offer based on a new 2018 Titan King cab SV Premium at 4.9% lease APR for 24 months equals monthly payments of $412 with $3,795 down payment, and $0 security deposit. Lease based on a maximum of 20,000 km/year with excess charged at $0.10/km. Total lease obligation is $13,690. 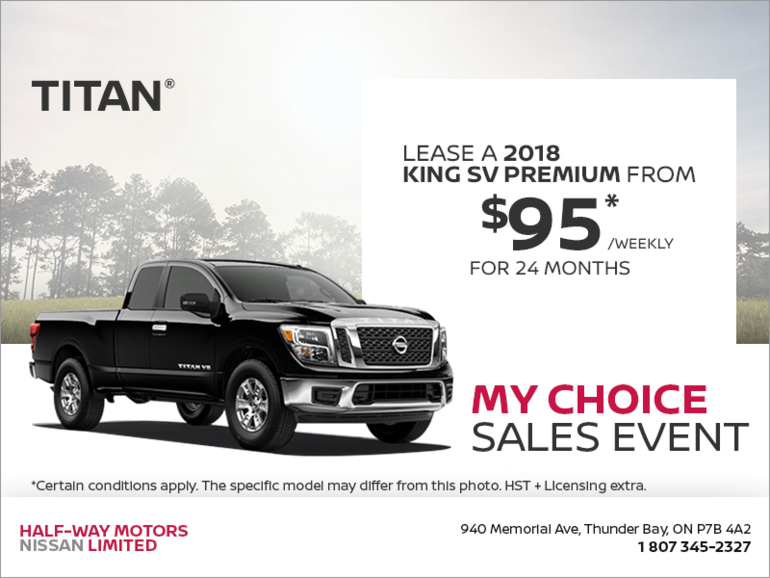 Lease Cash of $14,130 is included in the advertised offer.Up to 25% MSRP Cash Credit is applicable only to new and previously unregistered 2018 Titan models that are cash purchased or financed/leased through Nissan Canada Financial Services Inc. at a standard rate of interest from an authorized Nissan dealer in Canada between April 2nd, 2019 and April 30, 2019. MSRP Cash Credit: i) cannot be combined with subvented lease/finance rates or other offers; and ii) will be deducted from the negotiated selling price before taxes. Value of MSRP Cash Credit is calculated based on vehicle MSRP, plus freight, A/C and tire charge. $17,700 (25% MSRP Cash Credit) amount referenced is applicable only on the 2018 TITAN Crew Cab Platinum Two-tone with an MSRP of $68,798 plus $1,795 freight & PDE, $100 A/C and $17 tire charge. Amount of MSRP Cash Credit varies per trim and ranges from $5,500 (12% MSRP Cash Credit) to $17,700 (25% MSRP Cash Credit). Dealer may sell for less. See your participating Nissan dealer for complete details. Freight and PDE charges $1,795 air-conditioning levy ($100), applicable fees, manufacturer’s rebate and dealer participation where applicable. License, registration, insurance and applicable taxes are extra. Vehicles and accessories are for illustration purposes only. See your participating Nissan retailer for complete details. Certain conditions apply. ©2019 Nissan Canada Inc.